O Home Page O About Us O Stock Quotes & Research O Upcoming Sector Events O Mining Organizations & Schools O Mining Terms - Glossary O What is NI-43-101? "Arctic Star is now in the center of what could continue into a Tier 1 diamond discovery at Timantti." Breaking News (April 3, 2019): 'Arctic Star Begins 2019 Kimberlite Exploration Program in Finland'. Multiple backhoe trenchable kimberlite targets next to already discovered diamondiferous kimberlite bodies. Timantti Project, Finland (100%-owned); advancing the recent discovery of a cluster of diamondiferous kimberlites with large upside / world-class potential. Experienced management, and skilled technical leadership; taking point for Arctic Star Exploration Corp. are the same individuals that as lead exploration geologists discovered the Diavik diamond mine in Canada, and the Grib diamond mine in Russia. Valuation Commentary: Arctic Star Exploration Corp. (TSX-V: ADD) (F: 82A1) (US Listing: ASDZF) is a Canadian-based diamond exploration mining company focused on advancing its flagship 100%-owned Timantti Property in Finland, located 17 km from the town of Kuusamo, and only ~450 km SE of the multi-billion dollar producing Lomonsov and Grib diamond mines in Russia. 'Timantti' is the Finnish word for diamond, and Arctic Star is now in the center of what could continue into a Tier 1 discovery. The large land package consists of a 243 hectare Exploration Permit and a 190,000 hectares Exploration Reservation. The caliber of the exploration professionals that are associating themselves and reputations to the project is impressive, they include the former lead geologists that discovered Diavik diamond mine in Canada, and the discovered nearby Grib diamond mine in Russia. Arctic Star has already proved-up three diamondiferous kimberlite bodies within the Exploration permit, named White, Black and Grey Wolf, respectively, and three kimberlite dykes. Following caustic fusion processing 1,746 diamonds were found in 987.06kg of samples from four kimberlites, and curve analysis yields +1.18mm stones in each kimberlite. Three of the kimberlites, known as 'the three wolves', are within 300 metres of each other, they were found under only 1 to 3 metres of overburden, only a few hundred metres off the highway, and adjacent to power. Analysis of the distribution of microdiamonds from caustic fusion of samples from Arctic Star's best grading kimberlite structure, named the White Wolf, yielded ~0.7 carats/T (+/- ~20%) commercial stones, an earmark of if not a future mine on its own, certainly part of a future mine. 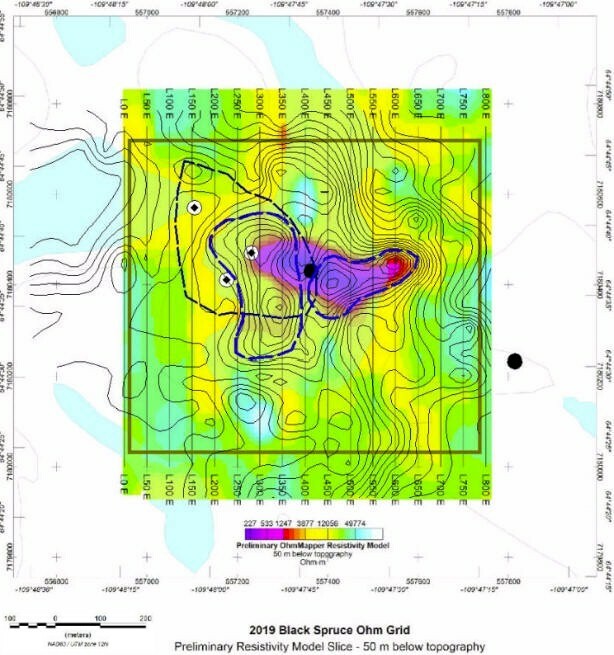 The Company's 2019 exploration plan is to prove the Timantti Project has world-class size potential by confirming more kimberlites; the exploration team will be testing several near-surface anomalous targets that are so apparently indicative it is difficult to think what else the anomalies could be other than more kimberlite bodies/pipes. 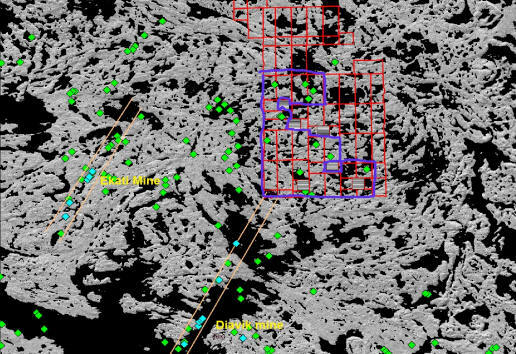 Arctic Star Begins 2019 Kimberlite Exploration Program: (see related April 3, 2019 news release here) The 2019 exploration program is designed to locate further kimberlite discoveries. Kimberlite is volcanic rock which hosts diamonds and predominantly occurs in groupings averaging a minimum of 30 pipes. There is considerable evidence that there are further kimberlites within the company’s exploration area as till sampling shows a distribution of diamond indicator minerals pointing to additional sources. 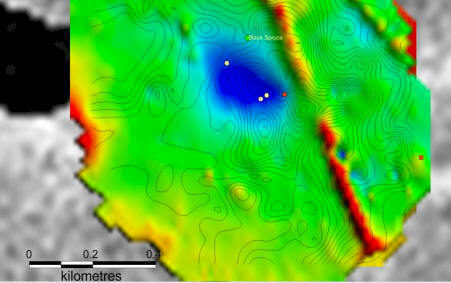 Also, over thirty magnetic anomalies that may represent kimberlites have been identified and prioritized within a 3km radius of the Wolf kimberlites. 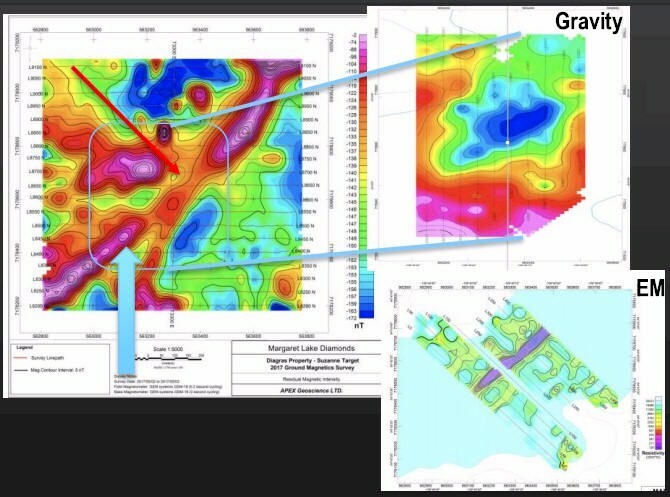 Initially the exploration work will consist of ground magnetic surveys over the priority targets, followed by trenching over the anomalies using an excavator. Arctic Star was successful in locating kimberlite using these methods in 2018, and there is every reason to expect this success can be continued in 2019. Kimberlite that does occur in the trenches will be sent for caustic fusion to determine micro-diamond content. Results of the excavation program will be disclosed as information on the testing of targets becomes available. Kimberlites with significant diamonds will be slated for diamond drill testing to determine size, and promising magnetic anomalies that could not be trenched due to till depth will also be drill tested later in 2019. Once Arctic Star has determined that most of the kimberlites in this new field have been tested for microdiamond content, the company plans to conduct bulk sampling on the most promising diamondiferous kimberlites, which will better define the grade and give a view of the average price of the commercial size stones. ADD.V poised for upside revaluation: Currently trading with a miniscule market cap of only ~C$9.1 million, the share price of Arctic Star Exploration Corp. is apt to rise near-term to better reflect the inherent value of its recently discovered diamantiferous kimberlite clusters at the Timantti Property and its potential. The missing ingredient that is holding the share price of ADD.V back is the streets need to see size/tonnage potential, something the Company's geological exploration team is confident it can deliver this 2019. 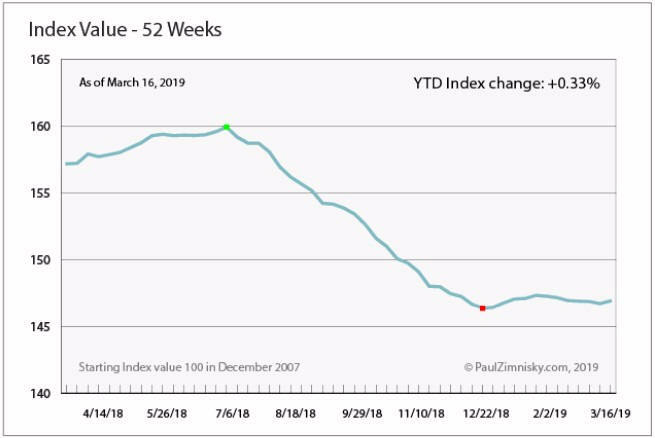 The markets are tougher on diamond exploration stocks now than in the past due in-part to the fact there has not been a new world-class diamond discovery made since 1990. If this was the 1990s and Arctic Star had done what it has done lately at Timantti, the share price of ADD.V would likely be over $3/share already. Purchasers of ADD.V now are getting a deal on shares. Kimberlite structures are rare -- the discoveries to date have mitigated the project risk, with weak hands now out of the stock, and the geological team dialed-in, it won't take much in terms of news flow to attract majors, serious money, and street attention that will jump the share price of ADD.V as the 2019 exploration season advances. Chart 1. (Above) -- Global supply peaked in 2006 with 176 million carats mined -- a level that will probably never be exceeded again -- before falling sharply through the global financial crisis. Since then it’s edged consistently higher amid a steady stream of new projects. Now, few new mines are scheduled, and some of the industry’s old workhorses are set to close early in the next decade. 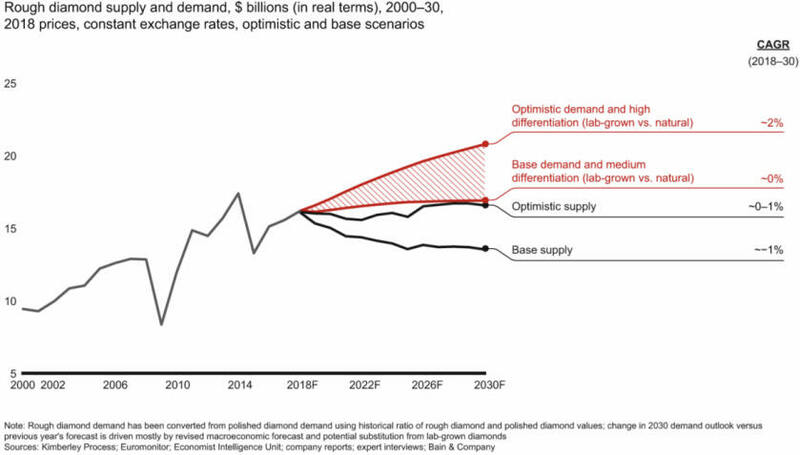 Two Separate Reports see Diamond Market Flipping to Deficit in 2021: Entering April-2019 Berenberg Bank analysts said "Rough diamond prices will remain flat for the next two years, followed by a nominal gain (sub-1%) in 2021. ... Prices for rough diamonds will start to improve in 2021-2022", said Berenberg’s Richard Hatch. Also entering April-2019 Analyst Kieron Hodgson of Panmure said "there may be a deficit of 15 million carats, or about 10 percent of global supply, in 2021." Figure 13. (above) Exploration Steps to Production -- Arctic Star is currently at the 'diamond' phase of the above illustration, before bulk sample. Since they know there are more kimberlites they can prove up, they want to find them and bring them all to the diamond phase. Doing a bulk sample on several sources of material is much more economic and mitigates risk. A decent bulk sample would involve producing 1,000s of carats and cost a few million. The plan is to get ~400 kg from each kimberlite discovery (150 - 400 kg of microdiamonds), line them up and see which are the best and bulk sample 4 or 5 of them all at once. Once Arctic Star has done that they are almost at prefeasibility study. Unlike finding gold, which can be nebulous, a geologist can easily identify kimberlite and the tonnage can be calculated quickly. Because each stone has its own price, each kimberlite is unique, so a fairly big fingerprint of diamonds is needed in order to know the average price of the diamond per carat before an economic study can be performed. Below is additional insight on Arctic Star Exploration Corp.
• April 3, 2019 "2019 Kimberlite Exploration Program Begins in Finland". • March 28, 2019 "Arctic Star Announces Closing of Second and Final Tranche of Over-Subscribed Private Placement". 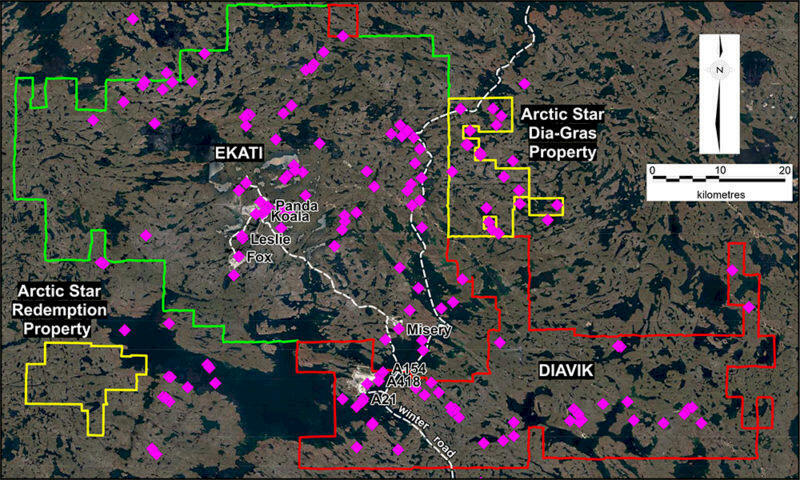 • March 25, 2019 "Arctic Star Exploration Corp. Commences Exploration Program at Diagras Property, Northwest Territories, Canada". • March 21, 2019 "Arctic Star Announces Status of Private Placement and Grant of Stock Options". • March 8, 2019 "Arctic Star Announces Extension of Private Placement and Increase in Offering". • February 11, 2019 "Arctic Star Announces Sale of Cap Property". • January 24, 2019 "Arctic Star Announces Non-Brokered Private Placement". • December 17, 2018 "Arctic Star Announces Resignation of a Director". • October 23, 2018 "Arctic Star Announces Management Changes". • October 11, 2018 "Arctic Star Exploration Corp stakes 8 new claims at Diagras property". • October 4, 2018 "Arctic Star Announces Diamond Results from Black and Grey Wolf Kimberlites, Timantti Project, Finland". • August 23, 2018 "Arctic Star Exploration Corp. Enters Option Agreement for Stein Diamond Project Nunavut, Canada". • July 30, 2018 "Arctic Star Reports Spring Exploration Program Results from Diagras Property, Northwest Territories, Canada". • July 5, 2018 "Arctic Star Announces Diamond Count of 758 Stones from Drilling at Timantti Diamond Project, Finland". • June 5, 2018 "Arctic Star Announces The First Diamond Results From The Spring 2018 Drilling On The Timantti Project, Finland". Overview of other projects of Arctic Star, advancing by Joint Venture with others. The Diagras Property (a.k.a. Dia-Gras) consists of 29 contiguous claims staked by Arctic Star, with an area of 25,595 hectares. The property is in joint venture with Margaret Lake Diamonds whereby Margaret Lake has earned a 60% interest. The property is located in the north-eastern part of the prolific Lac de Gras kimberlite field, 22km NNE of the Diavik diamond mine and 36km east of the Ekati diamond mine in NWT Canada. The Company has verified through research and compilation that the property hosts over a dozen kimberlites, most of them diamondiferous. Arctic Star’s research and compilation of historical data in the public domain confirms that Diagras is a property of merit that deserves additional exploration. Figure 14. (above) -- Location map. 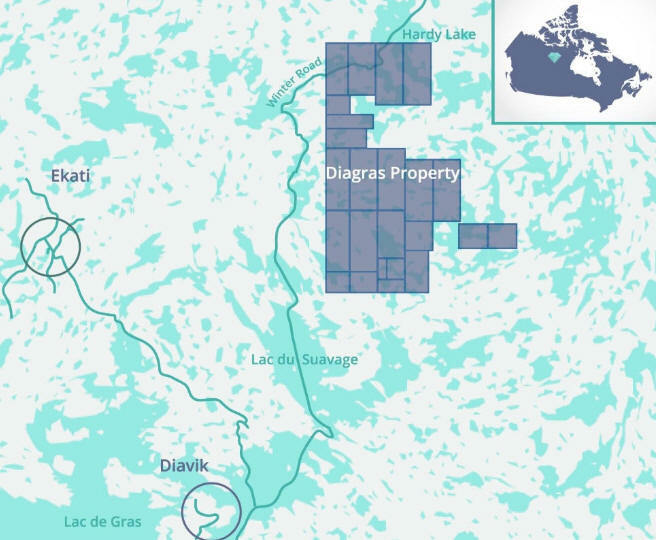 Arctic Star's Diagras Property is located just above Diavik (currently operated by Rio Tinto and sold 40% to the Washington Group for $1.2B.). Diavik has produced over 100 million carats of diamonds since 2003. 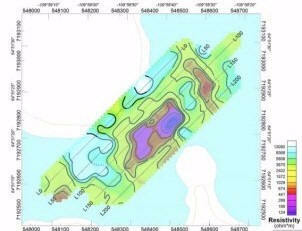 Arctic Star & Margret Lake is using new gravity and EM geophysical surveys to find new potential kimberlites. Figure 15. (above) -- The Diagras Property contains 13 known kimberlites discovered by DeBeers with Mag in the 1990's. Arctic Star is now targeting non-magnetics using new and improved gravity technology. In the image above Green Diamonds are kimberlites. Blue Diamonds are Kimberlites with mine plans that have Greater than 1ct/t. Figure 16. (above) -- Mag Survey from 2017 on Diagras. Yellow Dots (De Beers), Red Dots (Majescor) previous drill holes. Figure 17. (above) -- Gravity Survey from 2017 on Diagras. Gravity surveys show contrasts of Pyroclastic Kimberlite and kimberlite breccia revealing rock that is less dense than the surrounding country rock. Figure 17. 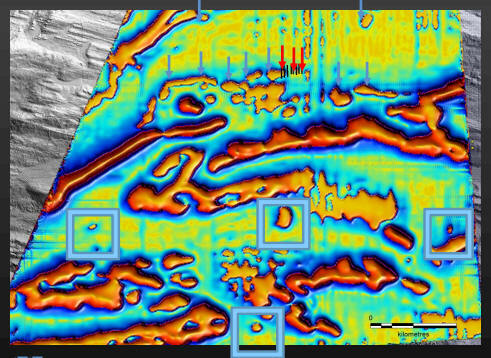 (above) -- Synopsis of the Jack Pine Kimberlite on Dia-Gras Property. Figure 18. 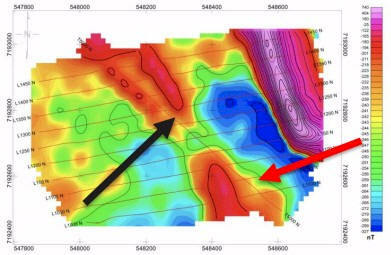 (above) -- Suzanne Kimberlite is assumed to be a magnetic low, (blue arrow). Ground Geophysical surveys conducted in spring 2017. 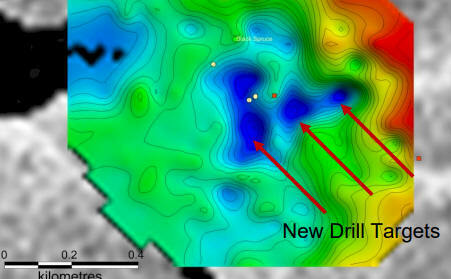 A second drill target has been discovered showing a separated gravity low, and linear Em anomaly coincident with a break in a Diabase dyke. Figure 19. (above) Diagras HLO2 Kimberlite. Two drill holes where previously drilled into a magnetic low shown by the red arrow. Figure 20. (above) Diagras HLO2 Kimberlite. Kimberlite was intersected. The EM anomaly shown above and located on the magnetic image by the black arrow, seems to break a Diabase dyke. ...Click Here for full copy of release from source. 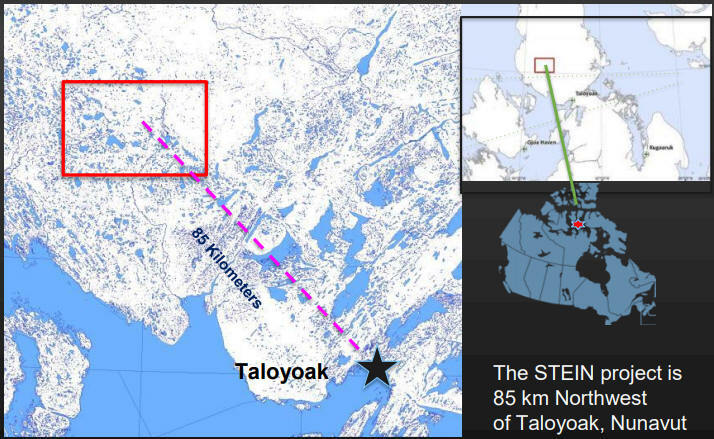 The Stein property is located 85 km NW of Taloyoak, Nunavut and consists of four adjoining prospecting permits covering an area of 105,637 hectares on the Boothia Peninsula. GGL Resources Corp. has the option to earn into Arctic Star’s Stein Project up to 60% by conducting ground geophysics on high priority drill targets and discovering kimberlite by drilling, trenching or in outcrops. $1.5 mil of exploration expenditures by previous explorers. Never drill tested. Kimberlitic indicator minerals are showing high chrome, low calcium G10 pyrope garnets were followed up-ice direction. Figure 21. (above) Stein Property. Mr. Power is a seasoned venture capitalist and financier with over 20 years of experience as a stock market professional and as director of public companies. Arctic Star benefits from Mr. Power’s wealth of experience as a savvy deal maker, an adept financier and as a results-driven leader of dynamic public companies. The company enjoys Mr. Power’s large network of contacts within the industry, his enthusiasm and his efforts as a member of the audit and remuneration panels. Mr. Doyle has 25 years experience in mineral exploration. He worked for Rio Tinto PLC for over 23 years, most recently he was Exploration Manager/Vice President of Kennecott Canada Exploration Inc. (owned by Rio Tinto), in charge of diamond exploration in North America. He was a key member of the Kennecott Exploration Australia team that discovered the multi-million ounce Minifie gold deposits at Lihir in 1987-1988 and led the team which discovered the Diavik diamond deposits in 1994-1995. Few geologists have seen 2 projects from discovery through to decision to mine. Mr. Doyle is recognized by his peers in the exploration industry as an authority on diamond exploration and kimberlite geology, and has authored/co-authored numerous papers on these subjects. He was awarded the 2007 Hugo Dummitt Award for excellence in Diamond exploration. Since leaving Rio Tinto Mr. Doyle remains active in the diamond sector through consultancy and non-executive directorships. Mr. Doyle brings to the company a disciplined scientific approach to mineral exploration and managerial skills that have a proven track record. He holds a BSc in Applied Geology from the Queensland University of Technology. Mr. Spencer is a GSSA Member and a Fellow of the AusIMM. Roy joined De Beers in 1966 and has been involved with exploration and deposit evaluation for gemstones and other commodities throughout his career. Roy’s tertiary education was at the University of Natal and Rhodes University in South Africa, and is a member of the Geological Society of South Africa and a Fellow of the Aus.I.M.M. As technical director of Peregrine Diamonds, he discovered the first kimberlites on the Pilbara craton in Western Australia in 1989, and as Leader of the Owners Team for Archangel Diamond Corporation he was largely responsible for the discovery of the world class Grib kimberlite in far northern Russia (February, 1996). In 1998, Roy created and raised the seed finance for Ilmari Exploration Oy to explore for gold, base metals and diamonds on the Karelian Craton in Finland. Ilmari went public in 2000, and discovered the Lentiira kimberlite cluster in central Finland in 2003. In 2006, as CEO of London-based diamond explorer European Diamonds, Roy led the Owners Team which brought the Liqhobong kimberlite (Lesotho) into commercial production on time and under budget. In mid-2007, Roy left European, a company which had evolved into a successful mid-tier diamond producer and marketer after having raised £23 million over a 6-year period. Since that time Roy has continued in gemstone exploration and deposit evaluation in Africa, Finland and western Russia for a variety of junior and senior mining companies. Mr. Charland is a seasoned communications professional with experience in raising capital and marketing resource exploration companies. He has helped raise over C$ 150 million for a variety of venture listed and private companies in mineral exploration and mining, technological and health sectors with the majority of the focus on mineral exploration and mining. His network of contacts within the financial community extends across North America and Europe. Mr. Jassal brings over 20 years of accounting and management experience to the Company. Mr. Jassal is a member of Certified General Accountants in Canada, fellow member of Association of Chartered Certified Accountants in London, England and holds Certificate in Accounting and Finance from Ryerson University Toronto. Previously, Mr. Jassal has worked in various accounting positions (including public companies) within the manufacturing, IT and telecommunication sectors. Mr. Jassal joined the Company in May 2006 and has been an important member of the team working on the financial and corporate side of the operations. We provide insight into resource companies, many which are so often overlooked gems and can provide exceptional potential to richly reward investors. The companies we select offer outstanding properties, management and experience in the mining/exploration industry.